This entry was posted in Uncategorized and tagged british shipping, cliwoc, colour wheel, dutch east indies, dutch ships, french ships, maps, R, shipping, spanish ships, visualisation by u. Bookmark the permalink. 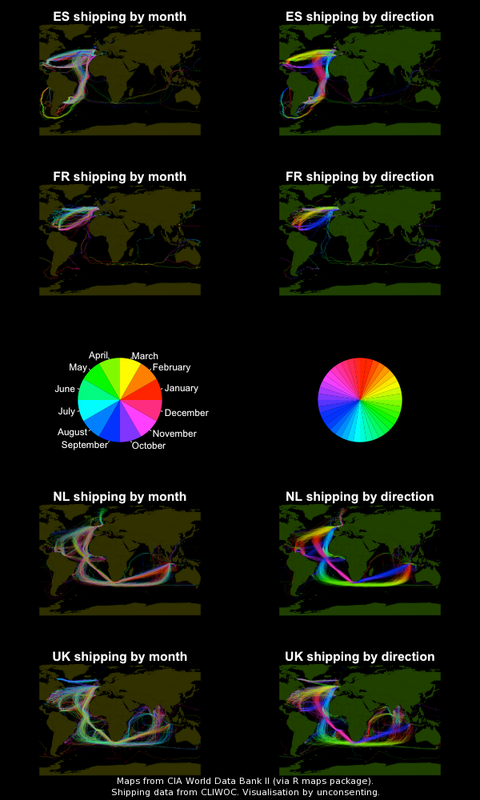 Nice maps- how did you assign the colours to months in R? I’ve printed the lines with the segments command. I can then apply a different colour to each segment using the col argument. Will you share the R code you used to create this graphic? Great visualization! Any chance you would be able to share the R code? Thanks! Hi there, I am an architectural student and have no means to study the codes, I am familiar with basic mapinfo and arcgis, wondering if you would be kind enough to released the data?